Provide comfort for the family of Carl Kosobud with a meaningful gesture of sympathy. 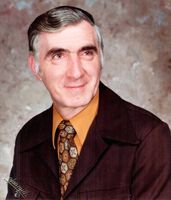 BANGOR – Carl John Kosobud, 91, passed away April 8, 2019 at a Bangor healthcare facility. He was born October 7, 1927, in Friendship, Wisconsin, the son of Frank F. and Dorothy (Crane) Kosobud. Carl graduated from East High School in Madison, Wisconsin, Class of 1945. Following high school, he enlisted in the United States Navy and served as an Electricians Mate. Carl received his Bachelor of Science Degree from the University of Wisconsin-Madison. Following college, he was recalled to the Navy serving during the Korean War. Carl married Rosemary Maciag in 1953, and together raised six children. In 1964, Carl and his family moved from Madison, Wisconsin to Bangor, Maine, where he accepted a job as the Planning Director for the City of Bangor. While working for Bangor, he earned his Master’s Degree from the University of Wisconsin-Madison. Carl worked in Municipal Government and Historic Preservation for many years after working for Bangor. In retirement he enjoyed working on his apartment buildings and spending time with his family. In addition to his parents, Carl was predeceased by a daughter, Gale Poulin; a son, Jon Kosobud; and a brother, Francis Kosobud and wife, Joyce. He is survived by his wife of 66 years, Rosemary Kosobud; children: Carl Kosobud; Lori Jonson; Paul Kosobud and wife, Donna; Craig Kosobud and Jane Colburn; grandchildren: Sarah Ware and husband, Jeffrey; Kalina Jonson; Jon Kosobud and wife, Melissa; Matthew Poulin and wife, Madeline; Kyle Kosobud and wife, Jessica; 11 great-grandchildren, nieces and nephews.